LONDON and Berlin are vying with one another for first place among Europe’s big cities in many areas: museums, symphony orchestras, tourist crowds. Less well known, they are also competing to become the continent’s leading metropolis for digital start-ups. This week’s issue features one article about Tech City, east London’s burgeoning start-up cluster, and another on barriers to the creation of new companies in Germany. But how do these two ecosystems, as geeks call such clusters, stack up? This post is the first of three comparing the start-up scenes in Berlin and London. IN A way comparing Berlin with London is unfair: the ecosystem in Germany’s capital is much younger than the one in London. Berlin has always had its fair share of conventional technology companies (Siemens, for one, has a strong presence there), but the cluster of internet firms is only about five years old. Compared to that tech toddler, London is a teenager: some date the beginning of Tech City back to the first internet boom in the late 1990s. The leading firms in each city are thus in different stages of development. Berlin-based SoundCloud (a service to share self-produced songs with more than 200m users per month), ResearchGate (the “Facebook for academics” with 3m registered users), 6Wunderkinder (the maker of a list and task management service with 5m users) and Zalando (an e-commerce site with more than €1 billion ($ 1.3 billion) in annual revenues) can easily be called “start-ups”: each is less than five years old. The label fits less well for the firms leading the pack in London: King and Mind Candy, two online gaming firms with tens of millions of players each, have both been around for a decade. Wonga, a lender that uses algorithms to make decisions about who to give money to, is six years old. Age difference notwithstanding, the hubs have much in common. They are now comparable in size. Estimates of the number of start-ups in Tech City differ widely, but if online maps showing their location are right, the cluster is now home to about 600 tech firms. This does not put London much ahead of Berlin. 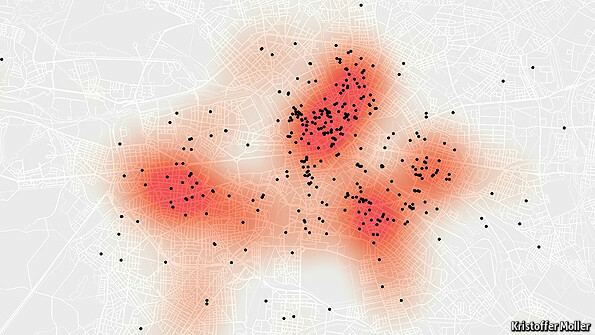 The database of Gründerszene, an online publication that covers the city’s ecosystem, lists more than 500 start-ups (the dots on the map above represent start-ups, the red area around them the density of amenities that cater to people who work at start-ups, such as bars and restaurants). Berlin now also has a similar support infrastructure to London: co-working spaces, accelerators (a start-up school of sorts), cafés and other places to meet. In London start-ups like to rent desks in Google’s Campus or in Warner Yard; in Berlin the places to be are the Betahaus and the Factory, which when it opens in a few months will be SoundCloud’s new home. In London the accelerator of choice is TechStars; in Berlin it is Startup Bootcamp. And in London overworked entrepreneurs sip their latte at Ozone Coffee Roasters; in Berlin they gather at the Sankt Oberholz (although the latter seems more of a place to work than to talk: at a recent visit to the Oberholz, of the some 100 customers most stared into their laptops or other devices). Both places are also decidedly international. Walk down Torstrasse in Berlin and you are almost as likely to hear English as on City Road in London—or Hebrew, Spanish or Swedish. Many start-ups in both cities were founded by immigrants: SoundCloud is run by two Swedes, Wonga by a South African. And in both cities entrepreneurs take pride in their diverse workforce: more than a dozen nationalities is no exception. Yet there are big differences in the urban environment in which both ecosystems exist. London is cramped, expensive and fast-moving. Berlin offers lots of open space, good value for money and an almost Mediterranean speed of life. This is less a choice than the consequence of history: war, Wall and Wiedervereinigung (reunification) have made the city lose most of its industry. Berlin has a population of 3.5m, but could easily take in a couple of million more. Nor do Berlin’s technologists have to share the city’s economic stage with other knowledge-heavy industries, such as advertising and banking, which dominate London. “To attract the best, most talented, most capable and most committed people, a creative ecosystem needs to command the local centre stage,” writes Matt Cohler of Benchmark, a leading Silicon Valley venture-capital firm, which has invested in ResearchGate and other firms in Germany’s capital. In contrast to London, where Facebook and Google have a growing presence, Berlin has yet to attract investment from a big information technology firm (only troubled Nokia has a developer hub there). Whether this is good or bad for Berlin probably depends on the time horizon. In the short term, start-ups do not have to compete with big firms for scarce talent. Yet in the long run, it could limit the talent pool: people who work for such companies often leave to work for smaller firms or strike out on their own. Although London boasts more experienced developers and managers, Berlin is dirt cheap. Salaries and rents in Germany’s capital have gone up recently, but they are still much lower than in London. Exact cost-of-living comparisons are tricky, but according to Numbeo, a comparison website, local purchasing power in Berlin is more than 40% higher. In other words, you only have to earn about £2,300 ($ 3,700) in Berlin to enjoy a standard of living that in London costs £4,000. Rents are more than 60% lower than in London. Some, however, question whether low cost is an advantage in the long term. “Cheap beer and rents don’t necessarily make the Berlin start-up-crowd the world’s most ambitious and hardest working”, warns Thomas Ramge, who works for Brand Eins, an edgy business magazine based in Hamburg. Indeed, Berlin attracts a lot of creative types who like to have fun and party. “And an investor can always make London as cheap as it needs to be,” says the boss of a British start-up (who does not want to be named because he is about to raise another round of financing). Read the second post here.